A so-so banking sector and a damaged reputation have weighed on the bank. It wasn't too long ago that Wells Fargo (NYSE:WFC) was regarded as the best of the big U.S. banks. Profitability and efficiency were well above that of peers, and asset quality was top-notch. Times have changed. A little over two years have passed since news of the bank's now-infamous fake-accounts scandal broke, and Wells Fargo is still trying to recover. When you combine the lasting effects of the bank's bad behavior with a so-so financial sector, it's no wonder that Wells Fargo has significantly lagged the market. 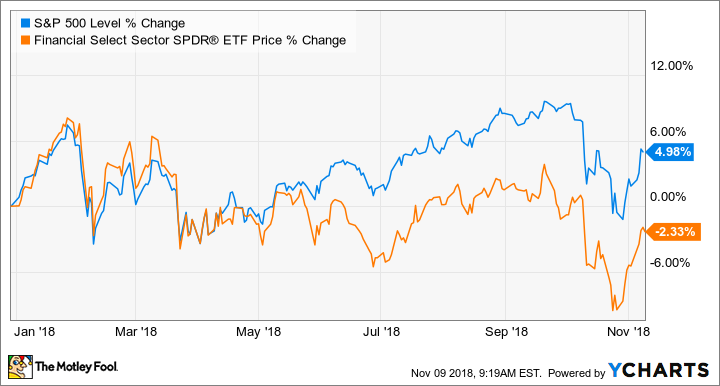 Not only is the bank's 12% drop in 2018 about 16 percentage points lower than the S&P 500's performance, but it also trails the banking sector by a big margin. Here's what investors need to know. One reason Wells Fargo has underperformed in 2018 is that the banking sector has been an underperformer. While the S&P 500 is up by 5% for the year, the financial sector is down by more than 2%. There are a few possible reasons for this. For one thing, bank stocks have soared in 2016 and 2017 as a result of positive catalysts like the outcome of the 2016 election, the passage of tax reform, and the generally strong U.S. economy. In a nutshell, as we headed into 2018, there were a lot of high hopes already priced in. While Wells Fargo's most recent earnings report was admittedly the bank's best in some time, the effects of the fake-accounts scandal and subsequent other scandal revelations are still very apparent. 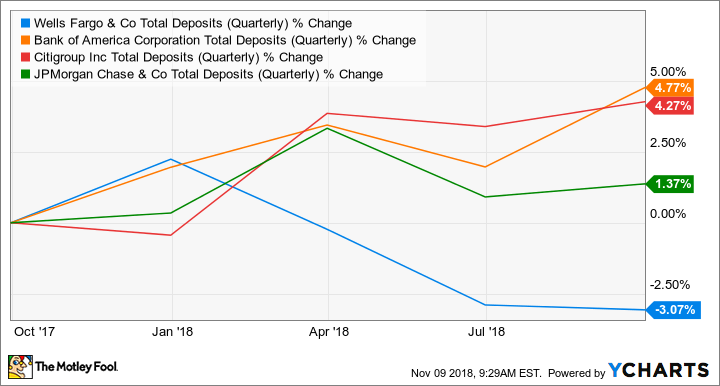 For example, while most banks experienced significant deposit and loan growth over the past year, Wells Fargo's have declined. WFC Total Deposits (Quarterly) data by YCharts. Efficiency and profitability are down significantly as well, and Wells Fargo has lost its lead in those categories among the big banks. There's also the ongoing possibility of legal expenses related to the numerous scandals that investors need to consider. Should you invest in a bank that's not allowed to grow? On top of the reputational damage, perhaps the worst problem Wells Fargo is facing is the penalty levied by the Federal Reserve. If you aren't familiar, the short version is that Wells Fargo is not allowed to grow larger than its asset size at the end of 2017 until "substantial improvements" are made. To be fair, there are some highly regarded investors who have spoken in support of Wells Fargo as an investment. Most notably, Warren Buffett, whose Berkshire Hathaway (NYSE:BRK-A) (NYSE:BRK-B) owns nearly 10% of Wells Fargo's stock, has said that he thinks Wells Fargo will be the best performer of the big banks over the next decade or so. And Wells Fargo's management, including CEO Tim Sloan, is doing an excellent job of trying to rebuild the public's perception of the bank. While Buffett may be right and Wells Fargo might ultimately be successful in moving past the scandals, it can still be difficult to justify buying Wells instead of one of the other big banks right now. The stock isn't particularly cheap even after the drop, the long-term impact of the scandals aren't fully known yet, and for the time being, this is a bank that isn't allowed to grow in what's arguably the best growth environment for banks in decades.